On Monday, Facebook launched Community Pages, and with this launch I noticed the subsequent change in the look and feel on some of my friends' info pages. There are minor design changes like bigger fonts and sections moved around, but what is most obvious is the new linking to Community Pages for your Activities and Interests and Fan Pages for your favorite Music, Movies, and TV Shows. Previously, if you clicked on someone's favorite activity, interest, or TV show, it would take you to a generic search results page. 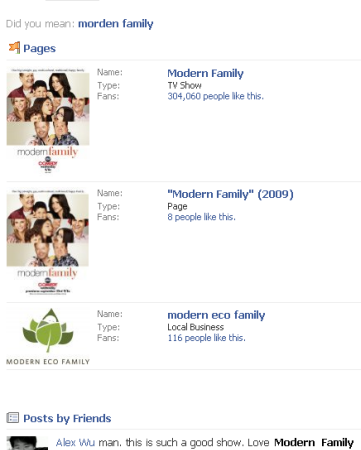 Now, it takes you directly to the Community or Fan Page (which you can now "Like" instead of becoming a fan). 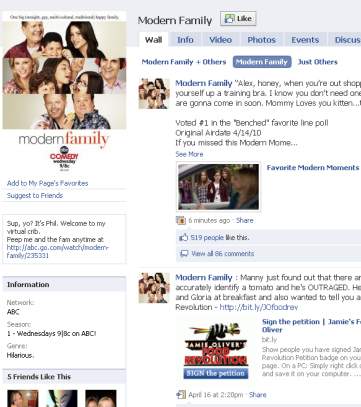 Here's an example for one of my favorite TV Shows, Modern Family. I haven't been a fan of some of the recent Facebook changes (new newsfeed, privacy settings), but I am a fan of this one. I think the new info page looks nicer and is more functional. That generic search results page will still get you what you want 9/10 times, which we can assume, is the fan page. But getting there directly while browsing a friend's profile makes the experience easier, quicker, and more enjoyable, without any extra intermediary steps. One more benefit to linking directly to the Community or Fan Page is that organizations, activities, or upcoming musicians that don't have an "Official" Fan Page will (hopefully) be linked to the best Community or Fan Page that is currently available. Profiles no longer are a static list of likes and interests. Now, they are a living map of all the connections that matter to you. I think this is a great step for Facebook and I encourage everyone to opt-in to these new connections to help enhance the collective Facebook experience!